Platelet rich plasma (PRP) is concentrated blood plasma which contains approximately three to five times the number of platelets found in normal circulating blood. Moreover, it contains platelet derived growth factor (PDGF), vascular endothelial growth factor (VEGF), transforming growth factor (TGF) and other bioactive proteins that aid in wound healing and possibly hair growth. 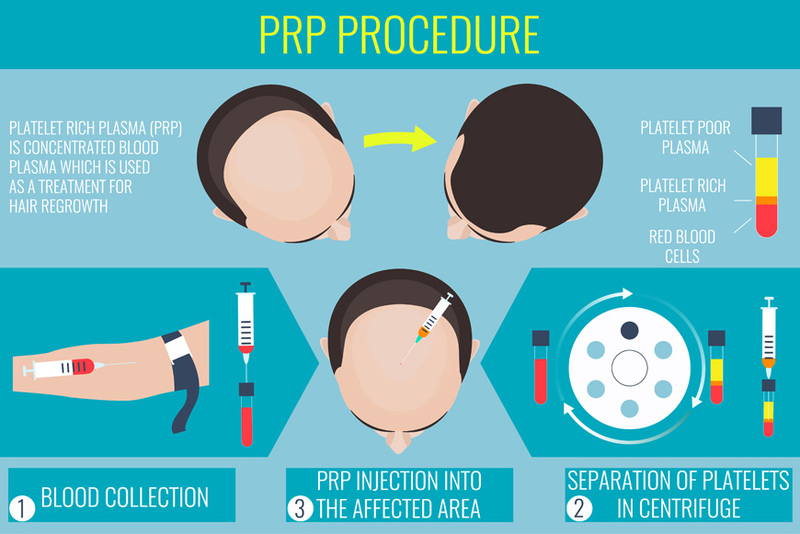 PRP – (Platelet Rich Plasma) technique which is new technique, now being offered in the field of hair restoration. PRP is a non-surgical alternative solution that can help and aid in the battle with hair-loss and thinning. PRP can be performed either in conjunction during hair transplant procedure or as a stand-alone treatment which Include increased hair density and takes about 45 minutes. We are now able to increase 5 times the growth factors, which naturally are found in the patient's blood ,spinning the whole blood in a centrifuge. The treatment plan includes drawing up a small amount of blood which later is spun in a centrifuge for 14 minutes. Meanwhile the scalp is disinfected, a topical numbing cream is applied, and a derma-roller is performed. Once the platelets and growth factors are separated, then a very small size needle is used (similar size to a Botox™ needle) to inject the growth factors into the thinning areas of the scalp. Then another procedure should be scheduled for a repeat series 6 to 8 weeks apart from the initial session. There are some minor preparations before Platelet Rich Plasma (PRP) treatment at Clinicana. The following instructions are organized according to the days and weeks before your procedure. Please inform your doctor in case you are taking any blood thinner as it may represent a contraindication to this treatment. These medications include Plavix, Coumadin and Heparin. You may use Tylenol / Paracetamol (acetaminophen) as needed prior to the treatment. If you are taking broad beta-blockers such as Inderal (Propranolol), please contact the doctor as this medication may need to be changed to a specific beta-blocker in advance of the treatment. If possible, please refrain from, or minimize, smoking three days prior to and one day after the treatment. Smoking may affect healing and oxygen delivery to the scalp, therefore, your results may be improved the longer you are able to stop smoking before and after the treatment. Prescription medications (including heart and blood pressure medication) should be taken as prescribed right up to, and including, the day of and the day after your treatments. Minimize alcoholic consumption the day prior to your PRP treatment. Shower the morning of your treatment and wash your hair very thoroughly using your regular shampoo. Do not apply sprays, gels, or any other styling products to your hair. If you wear a hair system, please remove it prior to shampooing and do not wear it before your PRP treatments. Please eat regularly the morning of your treatment and drink approximately ½ liter of water at least 2 hours prior to your treatment. Sedation is NOT required for PRP treatments. However, if you prefer, you may receive sedatives during the procedure. As these can make you drowsy, you cannot drive yourself. A: We use PRP to stimulate the growth of follicles, thereby reversing the hair miniaturization (thinning hair) seen in androgenic alopecia (common baldness). Q: What are the benefits of treatment with PRP? A: Platelet rich plasma offers an additional way to stimulate hair growth, especially in people who cannot use other forms of treatment. For example, it may be useful if someone is not a candidate for a hair transplant, or cannot use finasteride. It is also useful in the treatment of crown thinning where a hair transplant may not be appropriate. Q: What is the treatment schedule? A: If PRP hair loss therapy is appropriate, we can begin your treatment at the time of your consultation. We will administer the next two treatments at 6 weeks intervals. You will be asked to return 3 months later. If you show improvement, follow up treatments will be given twice yearly depending upon your progress. Q: When should I expect to see the results? A: Usually patients see results in 3 to 6 months. However, the response time may be variable. Q: How long does PRP treatment take? A: It’s done during a simple office visit; about 30-45 minutes. Q: Can I go back to my regular routine after the treatment? Q: Will it work on a balding area? A: It works best where there is existing thinning hair. Q: How well does the treatment work? A: Platelet rich plasma treatment is relatively new, but there is substantial anecdotal evidence that it is useful. We will be monitoring your progress with serial photographs to assess the results. A: There is an individualized response to this treatment with a spectrum of effectiveness. It does not work in all cases. Patients are monitored to assess the benefits of therapy. Q: Is the treatment used in both men and women? Q: How much blood is drawn in a typical PRP treatment? A: The amount may vary for each patient depending on the extent of the hair loss, but the standard amount is 50 ccs. Q: Will my head be sore afterwards? A: You may have some very temporary soreness and swelling, but many patients experience nothing. Q: How many injections are done throughout the scalp? A: It depends on the area. The doctor will determine this at the time of the treatment. Q: Are there any cons to having PRP treatment? A: There is some inconvenience in that you need to have your blood drawn and there may be some temporary swelling in the treated area. Platelet rich plasma seems to be extremely safe, since we are using your own serum, but it is not successful in growing hair in all cases.